Blueberries are the "superfood" that may help improve memory. I know one of the facts about blueberries' health benefits is that they are powerful disease fighters. I love them in my breakfast smoothie for the taste and jazzy blue colour. I was really pleased to see that blueberries are now linked to memory boosting. 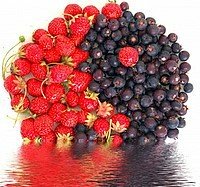 The article below tells about how a recent experiment concluded this berry superfood can improve your cognitive abilities. A new study published in the Journal of Agricultural and Food Chemistry has shown that drinking a glass of blueberry juice every day can give your brain a boost and improve your memory.Blueberries are already known to be one of the richest sources of antioxidants, the natural substances that fight damage caused by free radicals. these versatile and great tasting berries have proved to be great at helping the body fight serious degenerative diseases, including heart disease, cancer, high blood pressure, diabetes, muscular degeneration, Parkinson's and Alzheimer's. According to this important study, older subjects with age related memory problems who drank blueberry juice daily showed an improvement in their memory.Specialists have long suspected that the food we eat and what we drink affects our mental capability, although this is the first research to demonstrate the benefit of a super-food such as blueberries in improving the memory of people at risk for dementia. The study was conducted at the University of Cincinnati. In the study, people in their 70's with age-related memory problems were tested for learning and memory. One group of volunteers drank 16 to 20 ounces (2 and a half cups) of a commercial blueberry juice every day for two months while the control group drank a berry flavored non-juice beverage. The study members who drank blueberry juice showed significant improvements on tests for learning and memory compared to the control group. In the past animal studies had shown that blueberries may improve memory function, but there had been little actual testing of blueberries' effect on people. In addition the study showed that blueberries are linked to decreasing symptoms of depression and lowering blood sugar levels. The study scientists concluded that "consistent supplementation with blueberries might offer an approach to forestall or mitigate neurodegeneration." Other interesting facts about bluberries is that studies show they may even be instrumental in preventing osteoporosis (loss of bone mass) as well as lowering cholesterol and other blood fats. Blueberries have been shown to be instrumental in protecting the brain from free radicals, radiation, inflammation, and excitotoxicity. Add this to the facts about blueberries: they may also reverse decline in cognitive and motor function. In addition to its anti-aging properties, blueberries health benefits are that they have high levels of Vitamin C and Vitamin E.